Q: What steps will you take in your term to promote social equity and justice? You often log onto the Internet, there are praises as well as criticism on the performance of the Chinese government and yourself. How do you view the criticism? A: Equality and justice shine more brightly than sunshine. In the past nine years, we have done a lot of work to promote social equity and justice. On the legal front, we amended the Constitution to include respect and guarantee of human rights. We established a Property Law to protect legal private assets. We also amended the Election Law to make rights of urban areas and rural areas equal. We also abolished the Measures for Assisting Vagrants and Beggars so that migrant workers can enter cities freely. Second, in rural areas, we abolished the agricultural tax to ease the burden of farmers. Third, in education, we've made nine-year free compulsory education available all over the country. Fourth, we established and improved the social security system, including old-age pension, medical care and low-income subsistence allowance. Medical care insurance for working and non-working residents and a new type of rural cooperative medical care cover the whole nation. First, formulate an integral plan to reform the income distribution system. Second, establish and issue regulation on expropriation and compensation of rural land. Third, extend old-age insurance to the whole country. Fourth, boost poverty relief in poor areas. Fifth, we've arranged the budget for educational expenditures to account for 4 percent of GDP. We'll make every effort to attain the goal and make sure all expenditures reasonable. All the power of government is entrusted by the people. Therefore, we should create conditions for people to criticize the government. It feels natural for me to see people's criticism. In fact, many important decisions of government derive from people's criticism. I even think of inviting representatives who often criticize the government to Zhongnanhai, the Chinese government's central compound, to listen to their advice face to face. However, there are also slanders about me, which pains me. My individual personality is not understood by them and I feel a bit worried about society. I will press ahead and continue to struggle with courage despite slanders or rumors. Q：China and the Arab countries have had a long history of relations. I see a wide gap between China's position and many other countries' relating to Syria. What's the reason behind China's position? How do you see the Arab people's demand for democracy and the future of relations between China and the Arab countries? A: Regard to the issue of Syria, China has no self-interest. China made its unbiased judgment on the basis of facts. First, I insist the killing of civilians in Syria must be stopped. Second, China respects the legitimate demand of the Arab people's call for democracy, change and own interests. Third, China supports the UN and the Arab League's mediation effort. Last, China has deeply sympathy for the suffering people and we will commit ourselves to the humanitarian work there. The Arab people's demand for democracy must be respected. It is a tendency that cannot be held back. China and the Arab countries have a lot of consensus. China has a constant persistence in cooperating with them. China's position will be understood by other countries. 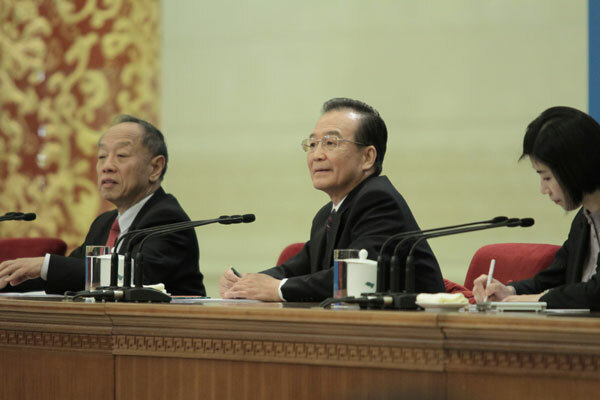 Q: China's annual economic growth has been set at 7.5 percent this year, lower than in pervious years. Is the downward adjustment temporary or permanent? Does it suggest the end of the high-speed growth period for the Chinese economy? How will the adjustment affect the global economy as the world hopes the high-speed growth of China can soothe the global slowdown? A: The aim of the adjustment is to advance toward technology progress and labor quality. We target high-quality growth, as well as adjustment in economic structure and development model. The economy will shift to an energy-conserving and environment-protecting model to deliver more benefit to the people. We set the economic growth target for the 12th Five-Year Plan at 7 percent. The target for 2012 is set in line with the target of the 12th Five-Year Plan. China is facing economic downward pressure with external contraction and European debt crisis. We set the annual growth for structural adjustment in economy, which is fundamentally beneficial for the global economy. Q: When can Chinese people elect their leaders directly? A: I have said on several occasions that we must adhere to the practice of self-governance by villagers in China and villagers' lawful rights to directly elect village committees must be protected. What has happened shows this has been a successful practice. The Chinese villagers have shown strong enthusiasm in participating in this process and strict methods of election have been formulated on the basis of the law of self-governance by villagers of China. I still believe that if the people are able to run the affairs of a village well, gradually they will be able to run the affairs of a township and then a county. We must continue to encourage people to take full steps to experiment and that can help enhance our people’s ability in this regard through these very practices. I believe that the democratic system of China will continue to move forward in keeping with China's national conditions and no force will be able to hold this process back. Q: I am from People's Daily. I've seen a new round of housing market regulation with tough measures. How much will the price drop to meet the target of regulation? Will the regulation be abandoned half way due to local governments' interest? A: I've reviewed the housing markets regulations in recent years. I think this issue deals with the relationship between the interests of China's central government and local governments, especially those of land sellers. It also involves the finance issues and the benefits of many housing enterprises. So that's why it is a tough problem. However, we still see improvements in this aspect, because of the central government's hard determination and effective measures. China is a big country with more than 1.3 billion people, which is on the way to realize industrialization and urbanization. I believe people should have a place to live, but not necessarily their own apartments. The government will encourage people to rent houses. Regarding the development of the housing market, I hope it will develop healthy and smoothly or it will endanger the entire economy. The price should be considered according to people's income, invest and proper benefits. What I want to say is that the current price is far beyond that goal. Q: In recent years, you have addressed political reform on many occasions, why have you mentioned it for so many times and what difficulties confront the reform of China's political system? A: Yes, I have addressed the topic on many occasions; it's out of a strong sense of responsibility. After the crackdown of the Gang of Four, our party made many resolutions on historic problems and started the reform and opening up. But the mistake of "cultural revolution" (1966-76) and the impact of feudalism have not been fully eliminated. As the economy develops, new problems arise, including income disparity, lack of credibility and corruption. To resolve these problems requires economic reform as well as political reform, especially reform of the leadership system of our party and country. Now the reform is in a critical stage. Without the success of political reform, economic reform cannot be fully achieved, the gains we have attained may be lost, new social problems cannot be resolved fundamentally, and the tragedy of "cultural revolution" may happen again. Every party member and leader should fully recognize this urgent task. Of course, I'm fully aware of the difficulties for political reform. Any reform must involve people's awakening, support and creativity. In a country with a population of 1.3 billion, we should bear in mind the national circumstances, and gradually promote a socialist democracy. Though not easy, the reform must go forward, it cannot stand still or go backward. I know that people will not only listen to what I say, pay attention to what I believe in, but also care what efforts I make to reach the goal. As long as I have a single breath, I will dedicate myself to the cause of reform. Q: What's your comment on the election of a new chief executive in the Hong Kong Special Administrative Region? What are the underlying problems facing the Hong Kong SAR other than the change of government and the European debt crisis? What's your hope for the future development of the Hong Kong SAR? A: Hong Kong now faces both difficulties and opportunities. Hong Kong is confronted with the dual pressure of a slowing economic growth and inflation other than the persistent effects of the European debt crisis and the financial crisis. To tackle the difficulties, Hong Kong should continuously promote economic development, improve people's livelihood, advance democracy and maintain social harmony, in particular address concerns of social justice, rising prices, housing, education and medical care. With respect to the election of a new chief executive, I am confident that Hong Kong residents can elect a leader popular with most Hong Kong residents as long as the election is held in line with the laws and the principles of openness, justice and fairness. Despite all these difficulties facing Hong Kong, I am confident that Hong Kong people can administer Hong Kong. I would like very much to revisit Hong Kong, talk to local people and meet with the college students. Q: In the past four years, the mainland and Taiwan have established unprecedented level of connection. Some say that the cross-Straits relationship in the past four year has been the most stable and peaceful of the past 60 years. What is your prospect on the cross-straits ties in 2012? You told the story of the painting "Dwelling in the Fuchun Mountains" before. The painting that has been apart for many years was on display in Taipei in June last year, how did you feel about that? Will you visit Taiwan next year after you retire? A: I'm very happy to see the cross-Straits ties becoming closer over the years. The 1992 Consensus have seen more solid foundation in terms of politics, economy and culture. The support from people has also become stronger. To promote peace and development across the Straits especially to promote the business ties, we need to advance the follow-up negotiation of the Economic Cooperation Framework Agreement. We will pay attention to the small- and medium-sized enterprises in Taiwan, as well as the grass-root people, especially those in the central and southern part of Taiwan. We will also advance cross-Straits financial cooperation including the bank clearing system and mutual investment. We will pay special attention to Taiwan-invested enterprises on the mainland by helping them upgrade development patterns and expand on the domestic market. The display of the painting "Dwelling in the Fuchun Mountains" shows great cohesion of Chinese culture. I sincerely hope the cultural and people-to-people contacts will be increased further across the Straits. I would love to visit Taiwan if conditions permit. I will ask you to convey my greetings to people in Taiwan. We believe, unity and revitalization of the nation will be one day achieved through united efforts of all Chinese people and that will be our great pride. Q: If there is one thing you can do to ease the trade imbalance between China and the US, what steps will you take? A: If we are to ease the trade imbalance between the two countries and to resolve the difficulties and frictions in business tie between China and the US, we still need to rely on cooperation. First, we need to further enhance two-way trade between China and the US. China is preparing to buy more from the US and the US needs to ease its restrictions on related exports of goods to China. Second, the two countries should work together to increase mutual investment. Both sides need to create favorable conditions for mutual investment and reach early agreements on investment protection. Third, we need to enhance cooperation in high-tech fields covering new materials, new energy sources, energy conservation, environment protection and aviation. Fourth, we need to enhance our cooperation in infrastructural development. At the same time, we should bring it in line with financial cooperation. That means China will make investment in infrastructural development in the US that will contribute to local jobs in US. I believe that will have mutual benefit. Q: This is your last year in office, how would you evaluate your work performance? A: I have served as premier for nine years, which are by no means easy or ordinary. I often feel there is more work left to do and I have many regrets. I hope people will forget me and all the concrete things I have ever done. Due to my incompetent capability, institutional and other restraints, there are many shortcomings in my work. I will work as a burdened old horse in my last year in office to the last day and make up for my regrets with new achievements to seek the understanding and forgiveness from the Chinese people. An old Chinese saying goes officials should serve as loyal as they can conscientiously when they are in office and engage in modest self-reflection when their terms end. I will live by this teaching and pass hope to my successors who I am confident will do a better job than me. In line with the conviction that I will do whatever it takes to serve my country even at the cost of my own life, regardless of fortune or misfortune to myself, I have served my country for 45 years. I have dedicated all my passion, energy and time to my country and my people, and never sought personal gains. I dare to face the people and the history.